Alas! Spring has arrived and I hate to tell you, but it might be time to put away those baggy jumpers and oh so comfy sweatpants and replace them with this seasons new trends. Now I know this is a hard time for fashion conscious females everywhere, a true example of the constant battles us girls face,comfort Vs style. But what if I could show you a way to enjoy the best of both this spring? Great news for all you 'girly girls' out there! Pastels, pinks, frills, bows, you name it and spring 2012 has it! 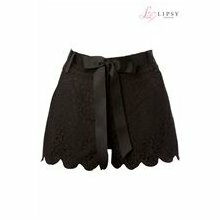 Lace shorts are something that had never even crossed my mind until this year but now they have a firm place not only in my head but also in my heart. Pictures #1 and #3 show you just how well they can fit into any outfit (who knew they could work with floaty tops AND the recent peplum trend?!) and therefore work for almost any personality. This look would work with either flats or heels and maybe even a pair of wedge boots. For A casual look, try pairing the shorts with a basic tee (colour of your choice). Comfy? Yes. Trendy? I think so.